Fast casual restaurants like Chronic Tacos represent one of the fastest growing segments in the franchise industry. The fast casual model is uniquely poised between full-service, casual dining and quick-service restaurants. In today’s hectic, time-sensitive world, fast-casual restaurants offer customers the delicious, quality food they want, with significantly less wait time and at a lower price point than more traditional full-service restaurants. As a result, this industry segment has experienced exponential growth across the United States and internationally. Franchising as an industry first came into its own during the 1930’s and 1940’s when several hotels and gas stations decided to begin offering new dealers a comprehensive system of operational and marketing strategies. Since that time the franchising industry has become a national power in the U.S. economy and a blessing for risk-averse entrepreneurs. Today, franchising is a major force in almost every industry imaginable, accounting for a disproportionate share of retail sales throughout the U.S. Here are some more interesting statistics gathered from the International Franchise Association. Franchisors also provide their franchisees with benefits that individuals would not be able to access starting a business on their own. The most obvious is a proven business model with an established product or service along with built-in brand recognition. As a franchisee you will also receive the necessary start-up assistance and training to avoid mistakes that other new businesses may encounter. You will also receive technical, operational and managerial assistance unavailable to independent businesses. It is estimated that franchise businesses are responsible for over 1.5 trillion dollars in economic output. The growth of the franchise industry shows no signs of letting up: more than 300 different types of industries and businesses are franchising accounting for 35 percent of all retail goods and services sold. Every franchisee receives initial training in beautiful South Orange County, California. Your training will cover every aspect of the Chronic Tacos Franchising System. Members of our corporate staff and strategic partner groups will show you how to effectively market your business, coordinate scheduling, manage the administrative and financial aspects of your business and oversee your employees. You will also learn everything there is to know about the Chronic Tacos menu, recipes, ordering, preparation and customer service. You and your management team will be trained by Chronic Tacos experts in the knowledge and practical application of our proprietary systems and techniques so that you can provide the unique “Chronic Tacos Experience” for your customers. You’ll also gain real world experience from our trainers as you make final preparations for a successful grand opening! Once your Location is ready, you will be ready and our team will be at your side for an additional three weeks help with everything from organizing the restaurant to training your team. Our step-by-step design review process aids franchisees in customizing their location to help ensure that you make the most of your chosen CHRONIC TACOS location. Additionally, CHRONIC TACOS site development vendors will work hand-in-hand with you to maximize your space while controlling development costs. When you join the CHRONIC TACOS franchise system, you’re joining a system that is being constantly refined and improved – you will become part of a growing brand that has been the recipient of local and regional accolades, high profile media attention and enjoys rapidly expanding brand equity. Chronic Tacos’ one-of-a-kind Momentum Program is a primary reason CHRONIC TACOS franchisees can get off to a fast start. Momentum is a pre-training program that walks you through every detail of your new business’s start-up. From mundane tasks such as applying for a local business license and obtaining your Federal Tax ID number to more expansive assignments such as initial employee hiring and the development of your grand opening target marketing campaign, Momentum ensures that you maximize your time before training. But most importantly, it helps ensure that once you return from training, you’ll be ready to launch your new business! We know exactly what you need for your CHRONIC TACOS location and exactly where to get it. We have done the research and we know what works. The result is a complete, recommended equipment and supply package that supports the operations of your CHRONIC TACOS location without inefficiency or excess. Obtaining the specified equipment and supplies will be straightforward and simple. We have developed a network of strategic partners, vendors and suppliers to whom you will have direct access. We believe that our franchise partners are the single most valuable asset to the organization. Providing outstanding support is not only a cornerstone of the Chronic Tacos culture, it’s a commitment that is never compromised and is consistently executed with a clear and defined focus on your success. National Branding & Marketing Support: Chronic Taco’s is committed to professional, sustained and effective marketing strategies and initiatives to ensure strong brand recognition and consumer awareness within your market. Public Relations: Professionally packaged and promoted, Chronic Tacos franchisees benefit from the national and regional Public Relations efforts, supported by the brand. High Profile Media Attention: The Chronic Tacos brand has been featured in numerous movies and reality TV segments and continues to receive consistent national media coverage. Local Search Optimization: Chronic Tacos Franchisees are provided with a location specific website landing page supported by local search optimization to increase online visibility and drive customer traffic. Administrative Backup and Support: Chronic Tacos full time support staff is highly accessible to assist franchisees with day to day administrative functions. Direct Access to Management: Live support line gives Chronic Tacos franchisees direct access to our entire team. Preferred Vendor: Chronic Tacos manages an entire network of preferred vendors and suppliers allowing franchisees to concentrate on building their business. National Training Conferences: National conferences bring our franchisees together to stay connected, share ideas, experiences and learn the latest methods of building and managing a successful Chronic Tacos franchise. Ongoing Training: – A variety of programs including workshops and in-store training that keeps our franchisees up to date with the latest trends, technologies and best practices within our industry. Chronic Tacos provides its franchisees with an exceptional business opportunity that offers the rare combination of true brand differentiation within a mainstream space. Chronic Tacos promotes a culture that values creativity, progressiveness and having fun which is supported by sound operating practices. Chronic Tacos delivers authentic flavors originating from recipes dating back more than 50 years. Over the years these recipes have evolved to incorporate our California lifestyle. Chronic Tacos is committed to delivering a “one of a kind” customer experience by creating a unique atmosphere that encourages personal interaction between guests and team members. 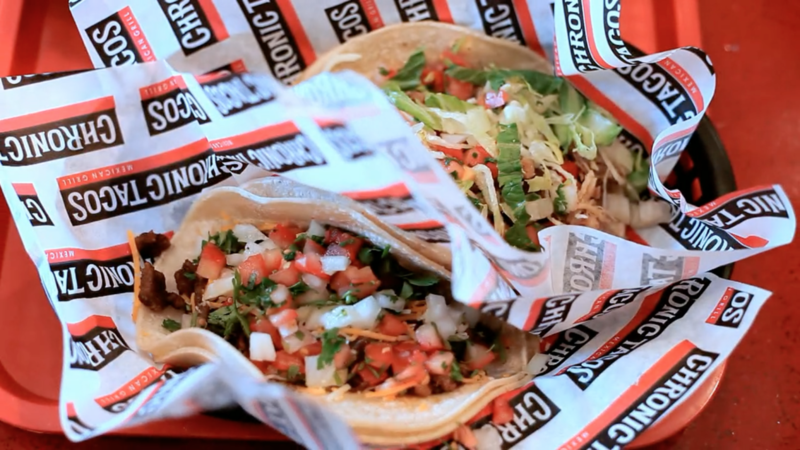 Chronic Tacos has invested in the use of a Big Data CRM logistic solution that has allowed the brand to increase customer engagement, loyalty and satisfaction. Chronic Tacos is an active member in its local communities and believes in giving back. Our brand has contributed to fundraising and campaigning efforts for several different nonprofit organizations, including No Kid Hungry, which aims to stomp out child hunger.